Being fascinated by water, like the sage Nirartha himself, who synthesized the Balinese canon in the 16th century, the last king of Karangasem built pleasure gardens around holy springs. 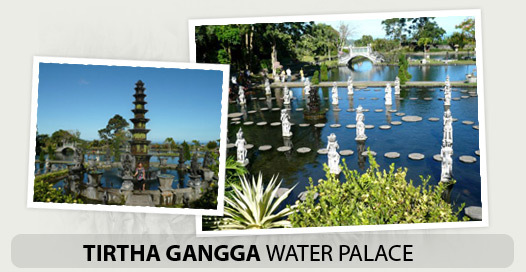 Two of these water palaces Balinese and guests enjoy to this very day: Tirtha Gangga on the hills overlooking the Bay of Seraya, and Ujung Water Palace on the ocean front near Seraya in Karangasem. Tirtha Gangga resonates doubly with the Balinese. First the name evokes the memory of the holy river of the Ganges in India. Secondly, 'tirtha,' meaning 'water' in Balinese, evokes the very nature of Balinese worship, as Balinese religion is called 'agama tirtha', the ritual of (holy) water. To this day you can come and refresh yourself in the ponds in the shade below the Banyan tree, and feel purified swimming together with the golden fish. It is believed the spring water will bring you youth and revived spirits.